The famous video in this post shows U.S. Navy Vought F7U-3 Cutlass (BuNo 129595) from VF-124 Stingrays suffering ramp strike on landing aboard the aircraft carrier USS Hancock (CVA-19) during carrier qualifications off of the California coast on Jul. 14, 1955. 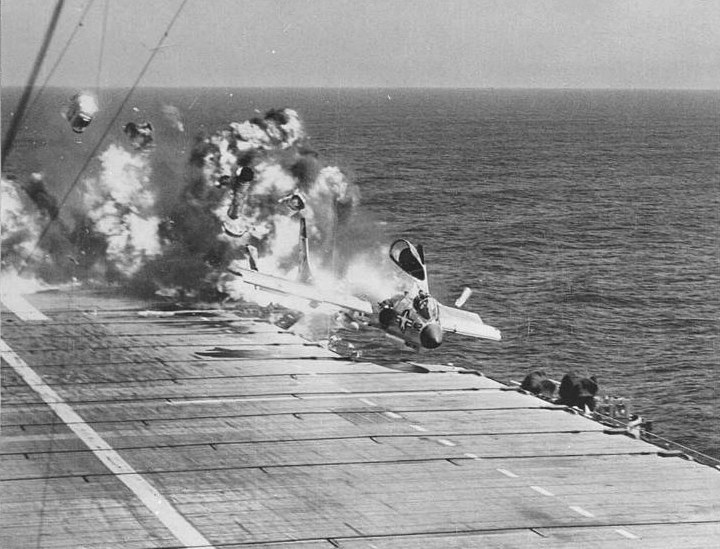 The pilot of this Cutlass, LCDR Jay Alkire, USNR, executive officer (XO) of VF-124, was killed when the airframe sank, still strapped into the ejection seat. The story behind this incident is nevertheless quite interesting. In fact, as a former F7U pilot explained in Robert R. “Boom” Powell, Commander, USN (Ret.) book Wave-Off! 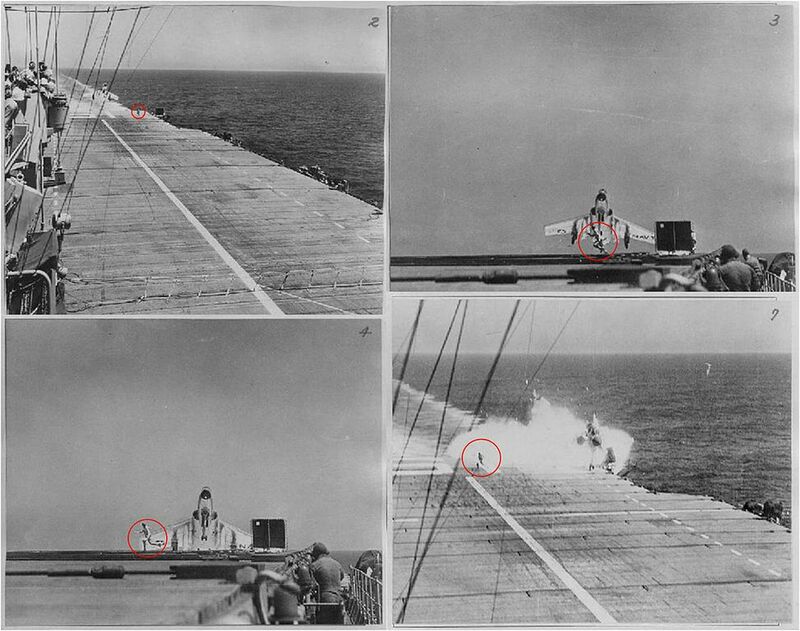 A History of LSOs and Ship-Board Landings, the Cutlass afterburners were a “hard” light. In other words, when the nozzles opened jet fuel sprayed into the hot exhaust and lit with a “whoompf,” but if there was not a light-off, the open nozzle caused a sever loss of thrust. About 25 hours were flown in the aircraft by pilots in a squadron new to the F7U before carrier qualifications. Alkire was low on the jet time and he had been flying multi-engine patrol planes. But the attitude at the time was that any naval aviator could fly any navy airplane hence why he was flying an F7U. In fact as explained by Powell, the Cutlass went low turning in the groove. LSO Lieutenant Tom Reilly signaled the low and to add power, but Alkire was slow to react and went lower. Reilly waved his arms over his head for a wave-off. Probably Alkire had shoved the throttles past the detent and the nozzles opened, but the afterburner did not light and the Cutlass headed for the LSO platform. Two other LSOs jumped into the safety net and scrambled through a hatch into the ship’s hull while the sailor working as the spotter/phone-talker leaped so hard that he went over the net and fell 50 feet into the ocean. Reilly only choice was to run across the flight deck to get away from the crash. The Cutlass smashed into the ramp and exploded in a fireball. 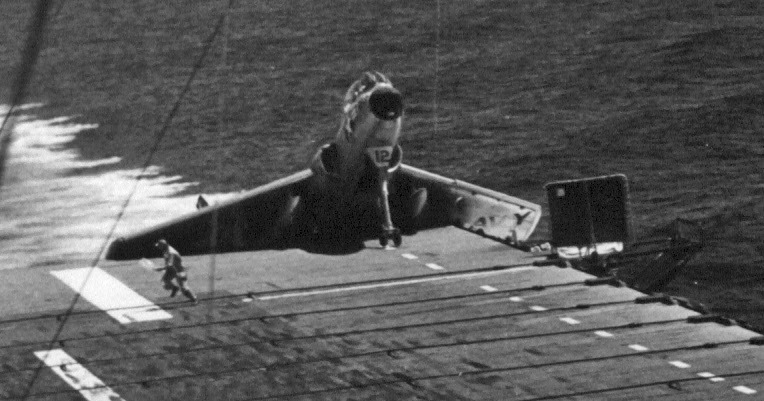 The landing gear, engines, and aft fuselage tore off and the fuel tanks exploded as the F7U rolled over the catwalk before falling into the sea. Witnesses said it looked as if the pilot was trying to fly, unaware that there was no airplane behind him. While Alkire was killed, the seven men that were in the port catwalk miraculously had only minor injuries.